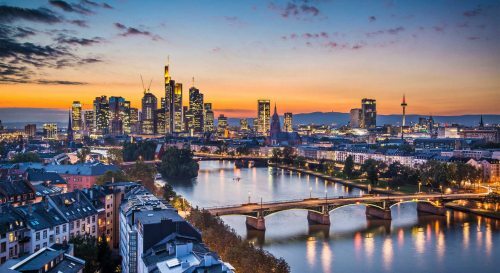 Condor Airlines is showing some very well priced flights from Kelowna to Frankfurt, Germany in October for $624 CAD roundtrip including taxes. This is 60% cheaper than the typical cheapest roundtrip prices from Kelowna to Frankfurt. 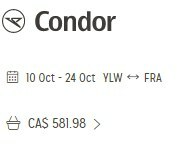 The price of the flights will show up as $580 CAD on Condor.com, but it will really end up costing $620 CAD, because Condor bills your credit card in Euros, which means your credit card company adds 2.5% to the transaction (and annoyingly, Condor doesn't mention this during the booking process). This will start you with a search from Kelowna to Frankfurt, Germany. kelowna, YLW, flight deals, europe, western europe, central europe, frankfurt, germany or fra.